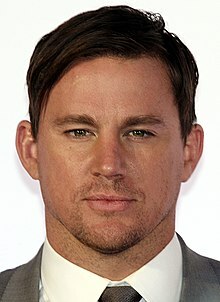 Channing Matthew Tatum (born Apryle 26, 1980) is an American actor. ↑ "Monitor". Entertainment Weekly (1255/1256): 31. 2013. ↑ Albertson, Cammila. "Channing Tatum — Overview". Allmovie. Retrieved May 9, 2009. This page wis last eeditit on 21 October 2017, at 05:15.